7 inch Guardian Angel Shadow Box, by Margaret Furlong. 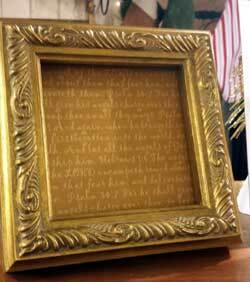 Three angel scriptures are repeated in pale gold against a deeper gold ground to create a rich backing encompassed in a gilt wood frame. Frame your 4", 3.5", or 3" Angel, Baby's First Christmas roundel or an ornament with the Word of God and hang in your child's room, your living room, the entrance to your home or wherever you will be reminded of God's promises. This is for the 7 INCH frame. Comes with an easel and a bracket for wall mounting. Introduced in 2007. Harvest Angel, by Margaret Furlong. Handmade of porcelain in Salem, Oregon. The 5” Harvest Angel is the third angel in a five year series titled, Seasons of the New Millennium. The series’ theme is, To everything there is a season, and a time to every purpose under heaven. The Harvest Angel represents the autumn season holding a sheaf of wheat with more wheat woven into her crown. She follows the 2000 Spring Angel and the 2012 Summer Angel. 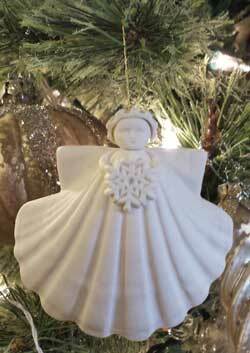 This angel reminds us that the Lord of the Harvest has come. He’s here now and is bringing many souls into the Kingdom. Alleluia to the KING!!! Acrylic two-part easel included. Measures 5 inches. Introduced in 2009. Handmade of porcelain in Salem, Oregon. 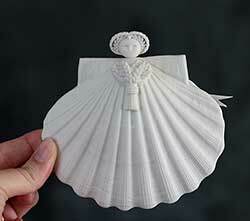 Inspired by a January snowstorm in 1989, Margaret designed this angel to celebrate our Creator, the Master Designer. The Spring Angel, first in “Seasons of the New Millennium” five-year series, was introduced in the year 2000 with an edition of 15,000. They will be offered until they are sold out. Token of My Love Heart, by Margaret Furlong. 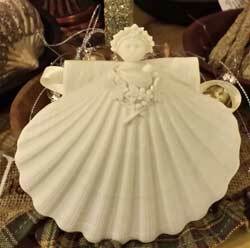 Handmade of porcelain in Salem, Oregon. Give away your love ‘cause that’s what makes it grow and grow. Measures 2.5 inches. Introduced in 2000.